Questions—and answers—about insulation materials for old house. 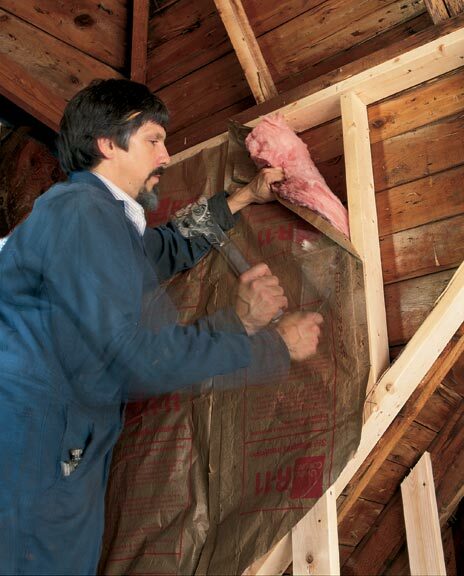 Many folks want to do the right thing by adding insulation to an old house. The benefits of insulation and its related materials (air and vapor retarders) are lower heating bills in the winter, cheaper air conditioning in the summer, and greater comfort year-round. Unfortunately, these products are nearly as numerous as the contradictory advice and moisture horror stories that surround them. Each of the following questions represents a common concern about insulating materials in old houses—many of them in the not-so-old category of early- and mid-20th-century construction. Once you understand the principles outlined in the answers, you&apos;ll have the basic tools for dealing with the specific insulating conditions in your old house. Q: Will blown-in cellulose insulation damage my old wood-frame house? A: The oil embargoes of the 1970s sparked a rush to insulate buildings of every kind. Blown-in cellulose became a very popular material for old houses: it was quick and cheap to add, and it even covered its costs through reduced heating energy bills. Where this insulation was improperly installed, however, many of us are now paying the price for the paint failures, rotted sills, and frozen pipes it caused. Blown-in cellulose is simply a shredded paper product. Its light, puffy particles can fill hard-to-reach voids in the perimeter envelope of a building. This definitely can improve the building&apos;s thermal insulation value. The problem is, air moves easily through this low-density stuff. As warm room air passes through the wall cavity in winter it becomes cooler. If this air has a high moisture vapor content, the water vapor will condense into a liquid, or freeze into frost, and start a vicious cycle of destruction. The condensation will wet the cellulose—just like that wet newspaper in the driveway—rendering it useless as insulation. Pretty soon the wood siding gets saturated and won&apos;t hold paint. 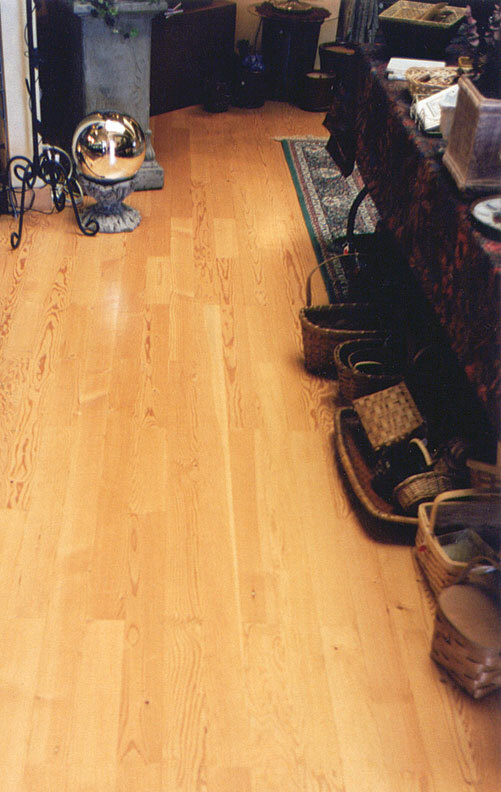 High moisture levels in the framing can even promote wood rot or attract wood-eating insects. I recommend restricting the use of cellulose insulation to extra-dry locations, such as attics, where it can be readily removed if the need arises. Don&apos;t forget about any water pipes up there. They&apos;ll freeze if they wind up on the cold side of newly installed insulation. They must be moved to a heated environment. Q: What about blown-in fiberglass or vermiculite? A: Like cellulose, these materials are great insulators. Better yet, they are not combustible. (Blown-in cellulose of the past was not always treated with fire retardant!) Blown-in fiberglass is a very light and puffy matrix of glass fibers that uses its high percentage of air space to do the work of insulating. Vermiculite (sometimes mistaken for asbestos) is a flaky, natural rock expanded to a pebble-sized mix that insulates in a similar way. Both these materials will allow air to easily pass through them the same as cellulose. Thus, they too have the potential to become waterlogged in the event of condensation, but to a lesser extent. Q: Which insulation is best for use in humid Southern climates? A: Insulation was first introduced in houses in northern climates where the temperature outdoors drops to -10º F or lower. This extreme cold creates a large differential in temperature through a wall between indoors and outdoors. Down south, even when it is 100º F or so outdoors, the differential temperature at a wall is only about half as much as up north, when the room temperature is about 70º F.
With year-round air conditioning being the norm in a southern climate, my primary focus would be on controlling outdoor air infiltration and its resulting cold-surface condensation. 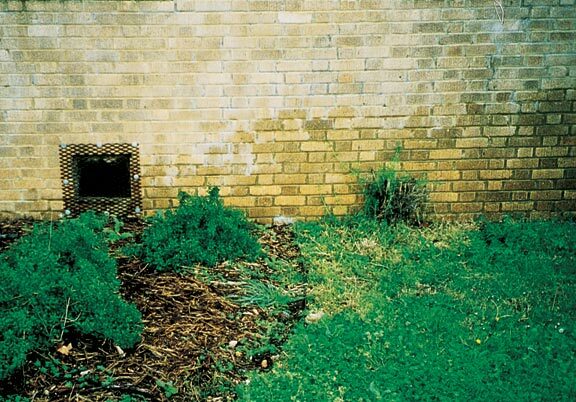 Mold growth is a constant threat as hot, moist outdoor air cools on contact with these surfaces. Old wood-frame houses down south can attribute their longevity to lots of ventilation, which helps dry out wet surfaces rapidly. Given this, in an old house I would lean towards not using any insulation. Instead, I would reduce infiltration to a minimum and use the air-conditioning primarily for its ability to dehumidify, thereby keeping the air as dry as possible.On the other hand, in newer construction the use of rigid insulation and outer coatings of stucco or Dryvit work very well. These coatings are excellent barriers to both moisture vapor and infiltration, and the thermal performance of the rigid insulation is not reduced, if they should get wet. Q: My walls are not insulated, but the paint on my siding is peeling. Why? A: It&apos;s not fair to always blame peeling paint on a poor insulation job. Moisture may indeed be the culprit, but something simpler could be the agent. Roofing, flashing, and gutter leaks often cause water to enter a wall cavity. Porous materials like plaster, low-fired brick, lime mortar, and wood will absorb this water and retain it for several days or weeks. Such moisture can make for poor adhesion at the time of paint application, or it can push what was a good paint job off the house soon after the leak begins. All these situations have the same solution: a moisture inventory. This is a visual inspection of the house using logic to identify and quantify unwanted sources of water (see box). Although moisture generated from a dirt-floor basement has a long way to migrate, it can easily end up as condensation on the back of siding. Similarly, residential humidifiers can be very damaging to an improperly insulated old house. Start your inventory with a ladder and inspect the whole house from a "rain&apos;s eye" perspective. Going a step further, simulate rain with a garden hose and ask a friend to keep a lookout inside the house. Inspections during an actual downpour are the best! Be sure to check for major moisture makers like combustion exhaust, green firewood, ground moisture migration, humidifiers, plumbing leaks, and rain or snow-melt penetration. If no leaks show up, you may well be the victim of a condensation problem. 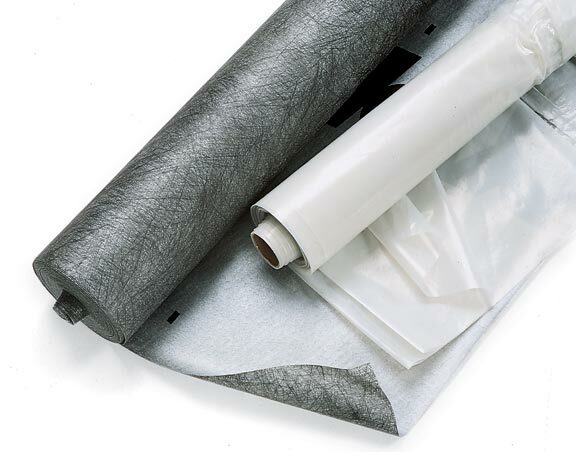 Q: What’s the difference between “housewrap” and vapor retarder? A: The various air retarder products that are generically called “housewrap” have become almost universal in new house construction over the last ﬁve years or so. Their sole purpose is to reduce air inﬁltration, thus making a house tighter. The housewrap itself is a unique balance of rugged synthetic fabric and microscopic voids. It allows moisture vapor to pass through the material, but resists gross air ﬂow. This is especially beneﬁcial for houses that are air-conditioned, since inﬁltration of unwanted outdoor air is a primary energy load on the cooling system. Housewrap is advertised to be an energy saver in heating climates too. 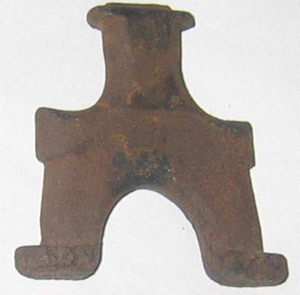 In any event, the material is inexpensive and has yet to prove harmful anywhere. My choice would be to use it as a weather barrier on the building’s exterior, under the siding. Deciding whether or not to use a vapor retarder is more difﬁcult. We even have trouble ﬁguring out what it is, why we need it, and where we should put it! Not long ago this stuff was referred to as vapor barrier. Now the manufacturers call it vapor retarder. It comes in many forms, with metal foil or poly sheeting being the most common. Its purpose is solely to block the passage of water in the vapor state. 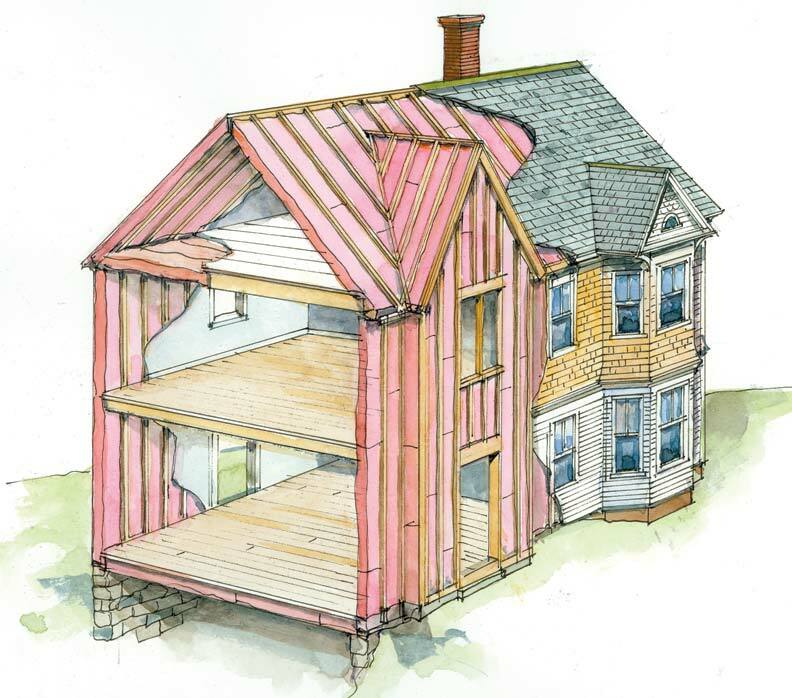 Q: Should I use a vapor retarder in my clapboard siding replacement project? A: First, I would conduct a moisture inventory and faithfully carry out a program of controlling unwanted water sources. If I am going through the agony of replacing sid­ing, I sure hope to add insulation at the same time. Vapor retarders and insulation should always go together. 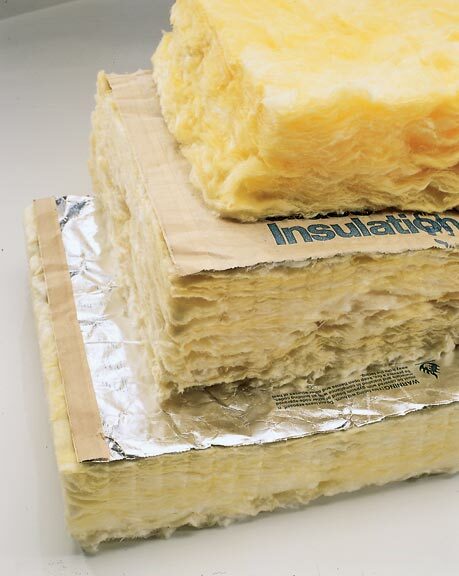 Without insulation there would be no reason to have a vapor re­tarder. (The same is true if there were absolutely no moisture sources inside the house.) But with insulation, I would want its protection. My choice here would be to insert foil-backed ﬁberglass batts in between the studs. I only have to remove some of the exterior sheath­ing so I can slide the batts in place vertically up against the back of the plaster lath. Ernest A. Conrad, P.E., is president of Landmark Facilities Group, Inc., a consulting firm specializing in historic buildings.